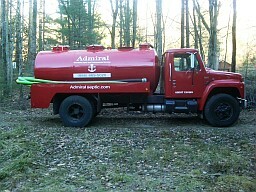 Septic Services Pricing - Admiral Septic serving towns throughout N.E. CT. Grease trap pumping starting at $415.00 plus tax for a 1000 gallon tank, $443.75 plus tax for a 1250 gallon tank, $472.50 plus tax for a 1500 gallon tank, $630.00 plus tax for a 2000 gallon tank, $710.00 for a 2500 gallon tank, $900.00 for a 3000 gallon tank and $1,175.50 for a 5000 gallon tank. If hand digging is required to access tank lids, charges are $25 per foot per location in sand. Soils with stones, roots, and frost conditions will be charged by the hour. Machine digging will vary based on the size and type of machine required. We accept major credit cards, and we are members of the Better Business Bureau and COWRA. Real Estate Inspections start at $279.00 for 1 system and $519.00 for 2 systems. Weekend Inspections are also upon request. Inspection reports are usually available via email 2 business days after the inspection date. If inspection reports are needed within the 48 hour period, necessary accomodations can be made with proper notification and a $60. additional expedite fee will be charged to the buyer. Our thorough inspections meet the Connecticut Recommended Septic System Inspection Report for real estate transactions in Connecticut. We are members of COWRA (Connecticut Onsite Wastewater Recycling Association), which is the professional association for septic system installers, pumper/cleaners and professional engineers.